Tone 11 is the day the shaman climb the mountain to the Highest Altars. 11 assists every new thing to find its place in the universe. 11 offers a new the “final clue” that can resolve the mystery within reach of our Human Understanding. The purpose of the shaman’s journey to a Higher Altar is to receive the Wisdom of Divine Discernment. 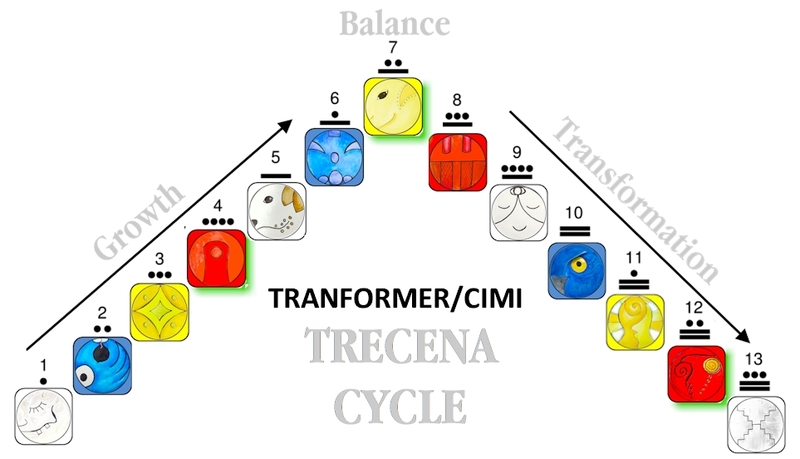 The trecena of the Transformer, CIMI, is leading a cycle of Major Life Change. Our Higher Discernment will be received as a Divine Intervention. Human understanding is Transformed through the Higher Consciousness of Spirit. The Revelation 12 prophecy for September 23, 2017 has been drawn to our awareness for a reason. We’ve seen other end-time dates come and go. Regardless of the outcome, we could discern a Value and Higher Purpose. Human’s fascination with these prophecies evidences the Seed of a Dream that lies dormant within. It’s awakened by the imagining of our own Dreams of Divine Justice. We find ourselves Dreaming of how we hope life could be changed. Imagining the Dream is the first step in the Sacred Cycle of Creation. What we are capable to Imagine holds the Power to come true. Our Dream could be the missing piece that leads to a Major Change of Consciousness. Today marks the “descent of Kukulcan.” At the Spring and Fall Equinoxes Kukulcan (aka Q’uq’umatz (K’iche Maya), and Quetzalcoatl (Aztec), descends as Light along the stairs of the pyramid at Chich’en Itza. A Light will begin to manifest after the zenith of the Sun in the ancient capital of the Yucatán Mayan. Thousands will recreate the celebrations of a thousand years ago as witnesses to the Light that descends as the Feathered Serpent. The Serpent symbolizes “lightning in the blood,” the Force of Life that “lights the fuse” of Spiritual Consciousness. The feathers illustrate the Divine Nature of the Spirit coming down. We still wonder at the mystery of why so many ancient sites were built to mark astronomical events and changing of the seasons. Wisdom/CIB is the symbol of the Ascended Masters and their Wisdom. CIB is a day to Honor the Old Ones who preserved the Sacred Wisdom that made our own Transformation possible. This is a day to give thanks for the Spiritual Principles that were passed down long before our lifetime. We can be grateful for the Sacred Wisdom that was carved in stone. The CIB glyph is an illustration of Human in its Highest State of Consciousness. The Rays of Light shown emanating from the head represent the Higher Consciousness made possible by Forgiveness. We were created for relationship. We must Know this Unconditional Love before we can Know the Creator. We perform a Divine Service when we choose to see others in their own Best Light. When we extend God’s Grace as the “benefit of the doubt,” we allow differences to be seen as something worth understanding. Through the Intention to be Forgiving, we recreate the Creator’s experience of Unconditional Love. Each morning when I put out new seed for the birds, I wonder if they’ve figured out where it comes from. The little Chickadees, Finches and Sparrows are perfect and beautiful exactly as they are, though it would seem a huge gift if they came close enough to acknowledge it came from me. They arrived early this morning before I had time to offer seed. They fly away when they see me coming, though one sat there looking at me until I opened the glass door. I could hear the morning conversation of birds in the nearby tree. Did they know what I was preparing? Does the Creator wonder the same things of us? In the CIMI trecena of Major Life Change, 11 Wisdom/CIB reflects a Divine Light of Awareness coming down in synchronicity with the Descent of Kulkucan. The Signs on the Mayan calendars signify a Major Change through a New Light of Wisdom. 11 CIB would offer the missing piece that will help us realize New Wisdom about our place in the universe. Throughout this trecena we’ve been guided to look to our Sanctuary within as a Place to Go in times of Fear, Sorrow, and Joy. The Sanctity of our Altar has been the theme of the past two trecenas. As Human, we naturally look to the outer world for the anticipation of our next experience. Yet, the life-changing experiences of Human are an “inside job.” Perhaps this Revelatory Change is a Miracle we will discover within. We could look at incremental changes over the past 9 months? Less than a year ago, women standing in unity began the biggest demonstrations since the Summer of Love. People from all sides have been standing together. In Houston, Florida, the Caribbean, and Mexico we see people helping people unconditionally. No one asked for party, religion, or color before saving a Life that hangs in the balance. Perhaps the possibility of “all standing together on the same side” is closer than we think. To all my relations, the Fall Equinox offers us a Night and Day of Equal Light. May we live our lives as though we hang in the balance between Darkness and Light. May we hold Faith in a Divine Tipping Point that could change the way we see our Self and each other. By all accounts we could be waking up to a new tomorrow. May we Imagine our Dreams and Receive the Transformation from a Light that descends on us. May we grasp the Present Opportunity for change by Acknowledging the Divine Source of all our Blessings. Wisdom/CIB: The old ones. Wisdom of the ancients. Wisdom persons are aligned with the ancient memories that wait in the stone of temples and sacred sites all over the world. Wisdom people grow luck like a crop using a balance of prudence and tenacity. The tremendous inner strength of this sign enables silent introspection to discover areas of oneself that contain wisdom more valuable than any trove of archaeological treasure. Wisdom persons are valiant defenders of family and community. They may become hardened to life and sentiment turned cold. In these cases, they need much forgiveness for their uncaring errors. Periodically connecting with nature and or visiting sacred sites will bring great stability to wisdom persons. A good day to sit on a rock. Cherokee, Owl U’GUKU’ O’JJ: Symbol is the Owl is Arcturus, the brightest Star in the Constellation Bootes. The Cherokee Bear constellation (Ursa Major) includes the Big Dipper plus four stars in Bootes. Owl is a hunter, who stands for the wisdom and ability of all great hunters, the cunning of a fox, the tenacity of a bulldog and strength of a bear. Energy for deep thinkers, strong-willed, rigid convictions, bold and authoritative. Owl is the Mystic Ferryman who guides Earthlings on the return path to the stars holding the torch aloft.